Note: analytics on managers is updated once an hour. If there were any changes, you will see changed data when exporting. At the top of page there is common filter, which stays fixed when scrolling. Under statistics you can see the gear icon, click it for setting of panel. There are headers of all KPI panel data. Opposite each header there is a tick, which allows to enable or disable reports. There is also a possibility to move blocks for location them in desirable ordering and to disable unnecessary ones. 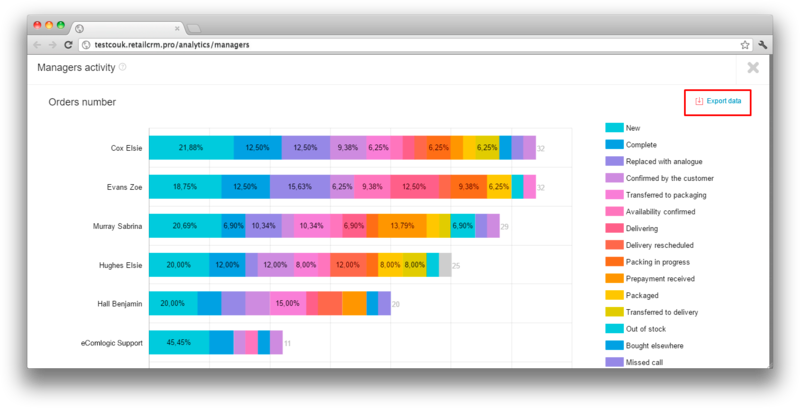 This widget shows top of managers, which have the largest values of these or those indicators for selected period. Percentage in small font above indicator shows change of current value in compare with previous one. «Income» column displays total amount of orders for selected period. «Order number» column displays total number of orders for selected period. «AOV» column displays the sum of all purchases for selected period divided by orders number for the same period. 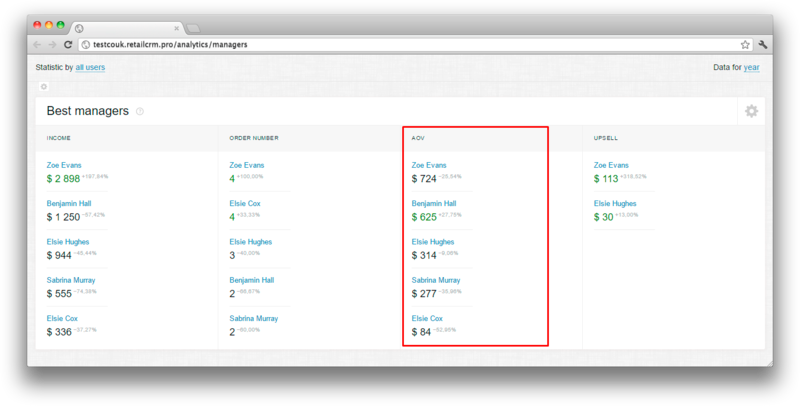 «Upsell» column displays additional products sales made by manager when creating the order for selected period. Also you can configure the report displaying using widget settings. There is a setting «Do not include cancelled orders», by default, so the report will be created on all orders except those, which are in «Cancelled» status. Do not include orders with zero cost — if to set this tick, orders with zero cost, for example created by phone, will not be considered. Do not include delivery cost — if to set this tick, delivery net cost of orders will not be considered. For example, delivery cost is 10 US dollars and net cost is 7 US dollars. In that case 7 US dollars will not be considered and 3 US dollars is taken as store income. Filter by only completed orders — if to set this tick, there will be only orders in «Complete» status considered in analytics. 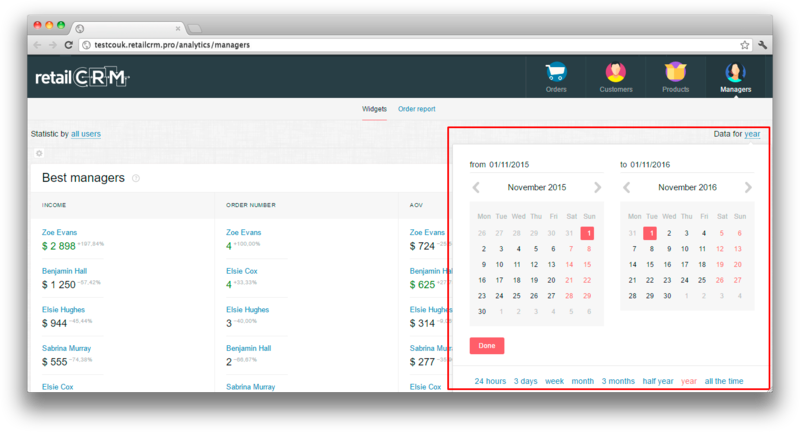 Filter by only paid orders — if to set this tick, there will be only paid orders considered in analytics. "Finances" widget allows you to see the expenses for managers for selected period. In detailed view you can see displaying of mentioned above parameters and export the report on each of them. «Calls» widget allows to see calls number, which were made, answered or not answered by managers for selected period. This widget displays average time of conversation or calls number by all managers. In detailed view you can see displaying of two above-mentioned parameters and export the report on each of them. 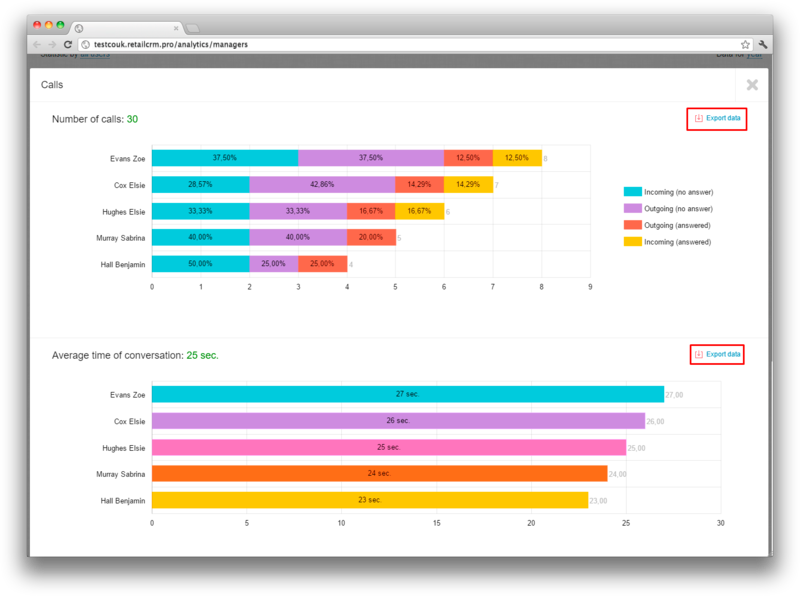 Report displays the task statuses assigned to managers for selected period. 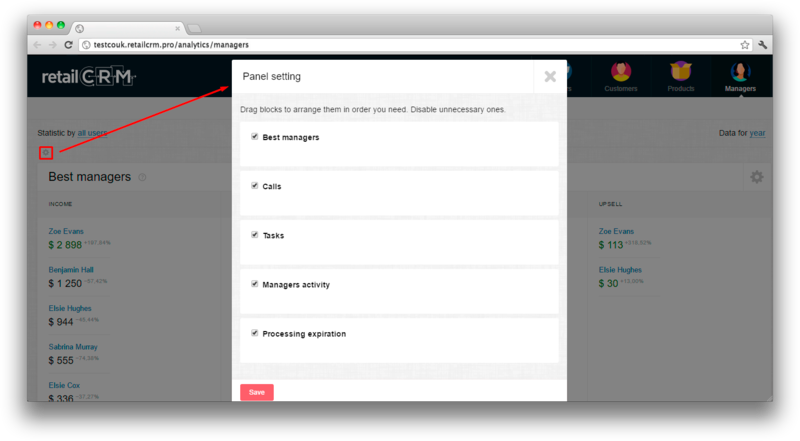 «Managers activity» widget displays how many orders to what statuses were shifted by managers for selected period. Repeated transitions to the same status are being linked. 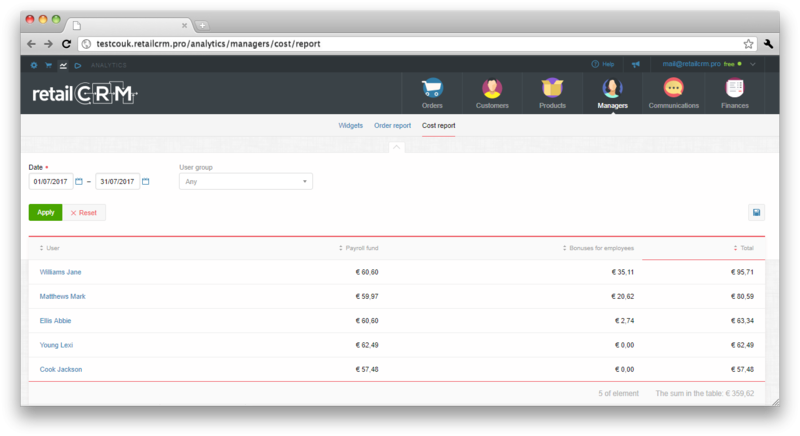 The third axis can be configured for displaying the status transitions or payment status transitions. In detailed view there is a possibility to export the report. «Processing expiration» widget displays how many times and in what statuses manager's orders were marked as «Expired» for selected period. Non-working time is not considered. Also this widget can be segmented by status. Note: when choosing the «Average expiration time» variant at the second axis, segmentation is unavailable. In this part of analytics on managers there is a detailed order report. I.e. you can see here the main parameters by each manager such as: order number, income, margin, average items per cart, upsell and AOV. It is possible to add columns for displaying using the gear icon button. You can filter report by necessary parameters. There are three fields, which you can filter by. These are: «Date», «Orders» и «Manager group». Note: the list is filtered by created orders by default. Table is sorted by AOV by default. Clicking the header of table, you can sort it by necessary parameter. This part of analytics on managers are displayed only if there is a telephony integrated. There are two tabs in telephony report, «Global report» and «Online report». In global report there are total and average indicators of telephony for all the time of manager existence in system. For example, such as total and average conversation time. 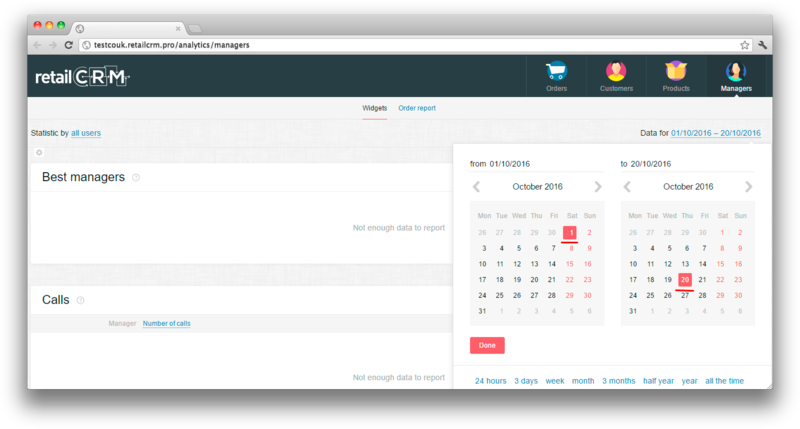 Also you can filter the report list by date, manager and manager group. 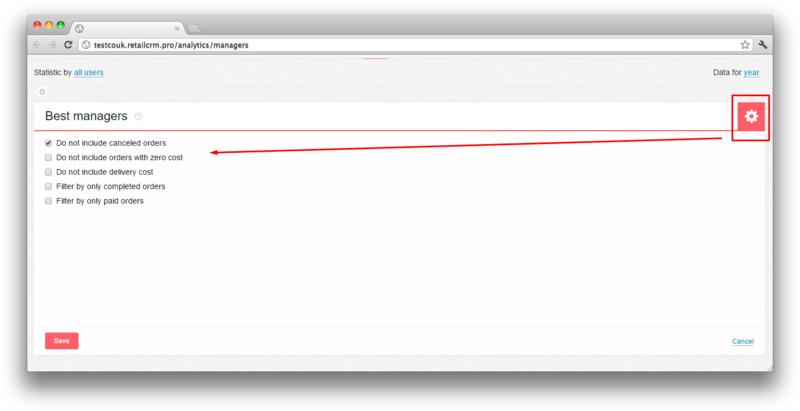 For setting of columns with parameters you should click the gear icon. There is also an opportunity to export the table. In online report there are total and average indicators of telephony for current session of manager in the system, and also whether the manager is Online now and what status he has. For example, manager signed in 7 hours and 19 minutes ago and made 18 outgoing calls. In online report you can filter the report list by manager, manager group and manager status. Average call time (since last transition from offline status to online). There is also a possibility to export table. There is a common filter at the top of page. choose time interval for getting data. In this section of analytics on managers you can see detailed report by costs per employee. I.e. here are main parameters by each manager in the system, such as: payroll fund, bonuses, total sum of employee`s salary.